I am working on an RC car, and I need to be able to reverse a 12v circuit that powers my main drive motor. I have a TIP102 transistor and a 5-30v relay for each motor terminal. I assumed that I could open up ground via the transistor on one side, and the power relay on the other, and then switch these to reverse. My motor runs each direction when hooked directly to the battery, and my relays are definitely outputting the full 12v, but I seem to have a problem with the grounding circuit. Whichever side has the relay switched on, that transistor gets very hot, and my motor doesn't spin. I tested the transistor and can get it to ground when on a single directional circuit with just the relay on one side and the TIP102 on the other. Here is my wiring. Can anyone tell me where I screwed up? If the diagram correctly represents what you have, it isn't obvious to me what the problem might be. One possibility is that the base resistors to the TIP102's are too large. Too little current into a transistor base keeps a transistor out of saturation, ie operating in a linear mode instead of switching mode, leading to high power loss and high heat. Slightly more likely is that the fairly high voltage drop across the Darlington in the TIP102 is just heating it up a lot. If, as suggested in a comment, you were to use an H-bridge motor driver, it might include heat sinks or might use MOSFETs with lower voltage drops; thus avoiding so much lost heat, one way or the other. As it happens, you probably don't need the transistors in the circuit anyway. Label the relays as A and B. Hook one of the motor leads to the common terminal of A, and the other motor lead to the common terminal of B. Hook the NO lead of each relay to V+, and the NC lead of each to ground. To run one direction, switch A on and B off. To run the other direction, switch A off and B on. To stop, switch both off. Not the answer you're looking for? Browse other questions tagged motor relay transistor or ask your own question. 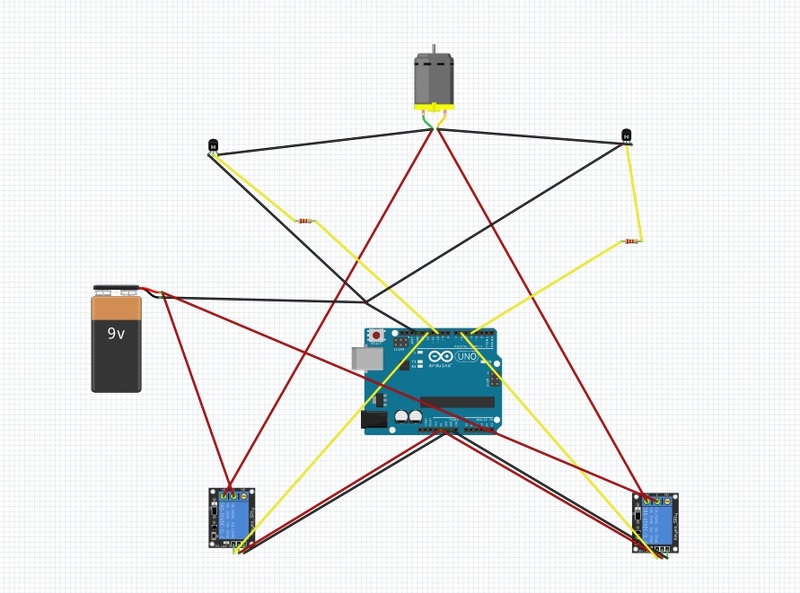 How do I run multiple vibration motors from an Arduino Mini with PWM?